The Athena package is composed of several science instruments that will be on the twin 2003 Mars Exploration rovers. One of the Athena instruments is the Mini-TES, which will characterize the Martian terrain from the roving landers using thermal infrared spectroscopy. The Mini-TES, or Mini-Thermal Emission Spectrometer, is an instrument being provided by Dr. Philip R. Christensen of the Department of Geological Sciences at Arizona State University. The goal of this website is to present up-to-date information about the Mini-TES instrument and its activites at Mars as well as information about infrared spectroscopy and links to the relevant Athena web sites. 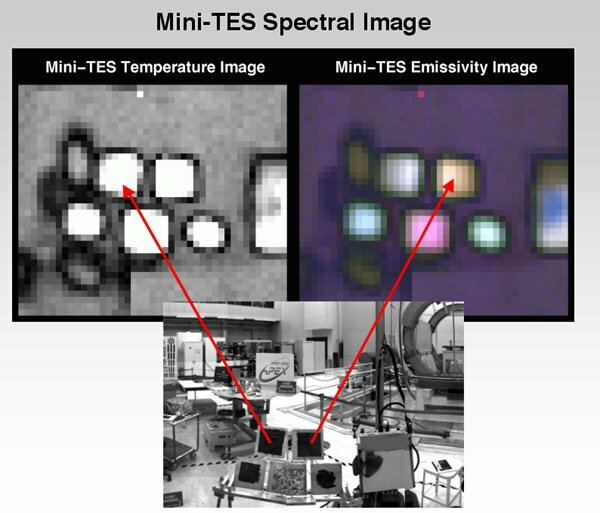 The Mini-TES instrument will capture temperature and emissivity images, which can be used to determine what materials are made of. This will enable the rover science team to find promising sites at a distance, and gather large amounts of detail about the geological environment on Mars. A slideshow of Mini-TES images is available, as are a slideshow of the minerals Mini-TES will be looking for in Meridiani and a slideshow of Mini-TES operational details. A brief technical briefing (PDF) is available, as is a more in-depth overview (PDF). Flyover movies of the MER landing sites are now available: Gusev and Meridiani. A Frequently Asked Questions list is also available.